When I got into UK model railways about 14 years ago I was mostly interested in early 20th century steam, Great Western Railway in particular but I also have a great fondness for the Southern Railways Terriers. 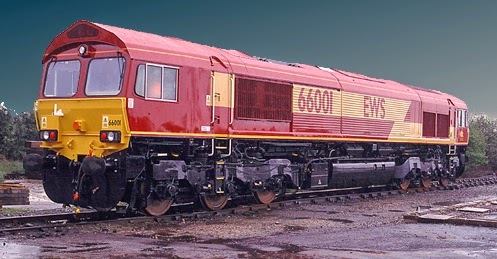 However one exception to that was the Class 66 diesel locomotive. They are a freight locomotive, operated by various companies both on the European continent and in the UK. and are manufactured in London,Ontario Canada by the Electro Motive Division (EMD). There was just something about the actual lines of the body that appealed to my eye and the EWS livery is to my mind very handsome . Unfortunately the models on the market back then were not very good in my opinion but in recent years that has changed. When I saw that Bachmann was offering them in the EWS livery with sound I just had to get one. It arrived last week and a lovely model it is, ran beautifully right out of the box and the sound was very impressive. I'm no expert on these locos and have never seen or heard one in real life so cannot comment on the accuracy of the model itself or the sound files, but it looks right to me and the sound works to my ear. So I checked photos of the real thing on the web and used them to guide my weathering job on this loco. I just wish my photography was better….